LLIPA project has already produced 1 mm tons, and tailings remain on the property. 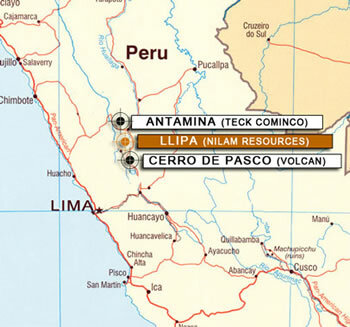 Nilam resources would like to put LLIPA back into production. Water accessibility for metallurgical and camp operations is accessible by canalization and piping distribution of nearby Quebrada Orcorán. The distance of water accessibility to plant location is only 800m. Electricity is obtained by harnessing Quebrda Shinbacocha waters that create hydroelectric power for mining operations. Qualified labor is accessible through Llipa district, Rajan and Cajamarquilla, and additional labor can be recruited from Huaraz and Lima city. Petroleum, gasoline and other fuels are obtained in Ocros and Huaraz provinces, as well as the Lima city.